It’s nice to be reminded on occasion that not all of our so-called representatives in Congress have gone over to the dark side. While the majority of our federal lawmakers exist to blindly serve the military-industrial complex and other corporate interests, a select few do appear to be intent on restoring the American public’s faith in government (Congress’ approval rating, according to Gallup, currently sits at a well-earned 18 percent). I think it’s most important for us … to recognize the necessity to have a Commander-in-chief who has foresight. Who exercises good judgment. Who looks beyond the consequences—who looks at the consequences of the actions that they are willing to take before they take those actions. So that we don’t continue to find ourselves in these failures that have resulted in chaos in the Middle East and so much loss of life. Gabbard, in other words, took a moral stand against Hillary Clinton and her bloodthirsty band of “humanitarian interventionists,” whose hawkish machinations over the last fifteen years have transformed the Middle East into a perpetual warzone. Hillary was, of course, the chief thug behind NATO’s smashing-up of Libya, and was later one of the loudest cheerleaders for regime change in Syria, despite conceding in one of her private, quarter-million dollar speeches to Goldman Sachs that the Syrian insurgency is dominated by terrorists who fight on behalf of our regional allies. [I]f we succeed in overthrowing the Syrian government of Assad, it will open the door for ISIS, al-Qaeda, and other Islamic extremists to take over all of Syria. There will be genocide and suffering on a scale beyond our imagination. These Islamic extremists will take over all the weaponry, infrastructure, and military hardware of the Syrian army and be more dangerous than ever before. even the ‘best case’ scenario—that the U.S. successfully overthrows the Syrian government of Assad—would obligate the United States to spend trillions of dollars and the lives of American service members in the futile effort to create a new Syria. This is what we have been trying to do in Iraq for twelve years, and we still have not succeeded. The situation in Syria will be much more difficult than in Iraq. Needless to say, her attempts to inject a voice of reason and logic into the public discourse were overwhelmed by the roaring din of the mainstream media’s propaganda machine. Few if any outlets saw fit to cover her argument and, if they did, it was only so they could denigrate it. After all, why should the American people have access to an alternative perspective—especially one as reasonable as Gabbard’s? That would only serve to undermine the state’s ability to manufacture public consent for its crimes. As I write, Gabbard is rapidly becoming something of a media punching bag, having committed the outrage of visiting Syria and, horror of horrors, meeting with President Bashar al-Assad. Headlines proliferate, the subtext sticking out like a sore thumb: “Gabbard Won’t Disclose Who’s Paying For Secret Trip to Syria,” “The GOP’s Favorite Democrat Goes to Syria,” and so on. The media campaign to slander a principled critic of US military aggression is underway, in other words. Thus far most of the abuse has been confined to Twitter, though op-eds are sure to follow. The purpose, as always, will be to disregard and confuse what Gabbard says she witnessed on the ground in Syria, since her account directly contradicts the politically-correct narrative. Never mind that, in personally visiting the war-torn country and speaking with its inhabitants, Gabbard has done more than most Western journalists who write authoritatively about the conflict…she either doesn’t know what she’s talking about or she’s lying, we’re told. The American people thus have two options: (1) credulously accept what the media tell them about Gabbard or (2) listen to what she has to say and, after doing additional, independent research, reach an informed conclusion about whether her position makes sense. 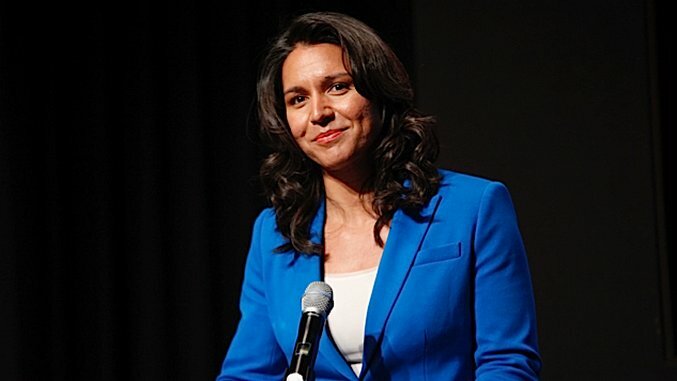 Those interested in option two would do well to read a short piece Gabbard wrote for Medium, in which she declares that ”[i]t is clear now more than ever: this regime change war does not serve America’s interest, and it certainly isn’t in the interest of the Syrian people.” Informing that view are meetings she had with “Syrian opposition leaders who led protests in 2011, widows and children of men fighting for the government and widows of those fighting against the government.” She also spoke with “Muslim and Christian religious leaders, humanitarian workers, academics, college students, small business owners, and more.” How many columnists for the Washington Post have made direct contact with an equal range of sources? This side of the debate on Syria, with a few notable exceptions (e.g. The Independent’s Robert Fisk), has been systematically censored in the West. From the start of the war in 2011, American journalists—representing Washington—have proclaimed to speak on behalf of the Syrian people which, if true, would mean that Assad has zero support outside of the government itself. This is, for lack of a better word, stupid, and the Syrians Gabbard met with asked that she “share their voice with the world,” since heretofore no one has listened. Small wonder that the Syrian government, as recently as December 2015, remained the most popular party to the conflict: it boils down to a choice between modern secularism and medieval savagery. Gabbard’s meeting with Assad was, according to her, unplanned. But even if it were planned, so what? Is conversing briefly with Syria’s president really more heinous than, say, hosting King Salman of Saudi Arabia at the White House? When Obama did so in September 2015, the Saudis were already seven months into their ruthless air war against Yemen, which has killed thousands of civilians—many with US-manufactured bombs, including illegal cluster bombs—and displaced millions. Nevertheless, Obama announced to the press at the time: “It’s a great pleasure to welcome his majesty King Salman to the Oval Office.” The media seemed largely on board with that sentiment, which would be scandalous if it wasn’t so predictable. Gabbard has recently introduced new legislation to Congress—The Stop Arming Terrorists Act. Its purpose is straightforward: to “prohibit the federal government from using taxpayer dollars to arm and support groups cooperating with or affiliated with terrorist groups like al-Qaeda and ISIS.” You can lend your support to the bill by signing her petition here. Tulsi Gabbard represents an aberration in our contemporary political culture: an honest, independent thinker with the courage of her convictions who’s prepared to stand up—alone, if need be—against the corporate-run mob in Washington. We pay her no heed at our peril.